The extraordinary and well-organised funeral procession of the deposed Iranian Shah in 1980 marked the first state funeral to be held in Old Cairo in modern Egypt’s history. The Egyptian president Anwar Sadat had done his best to give the Shah a dignified burial. Sadat had chosen the beautiful Rifa’i Mosque, where the Shah could be buried next to his ex-brother-in-law, the late Egyptian King, Farouk. Sadat’s decision to receive the ill Shah had not been a political move; it had been prompted (rightly or wrongly) by his sense of religious duty. He had felt the need to highlight a different side of Islam that promotes compassion and mercy—the two qualities Muslims recite in their prayers five times a day. These qualities stood in sharp contrast to the revenge and vengeance Iran had pledged in the 1979 revolution. But not everyone in Egypt shared Sadat’s vision; many Islamists who despised Sadat for his peace treaty with Israel and his warm relationship with the US did not view the Shah’s funeral through the prism of compassion. For them, the Iranian Islamic Revolution was an inspiring event, a template with which they could work to fulfill their dream of an Islamic state, a dream that, at the time, overrode the sectarian divide between the Shi’a Iranian regime and the Sunni Egyptian Islamists. The two Islamist factions shared a deep sense of disgust toward Sadat, and viewed him as a traitor who had sold his soul to the “Zionists”. 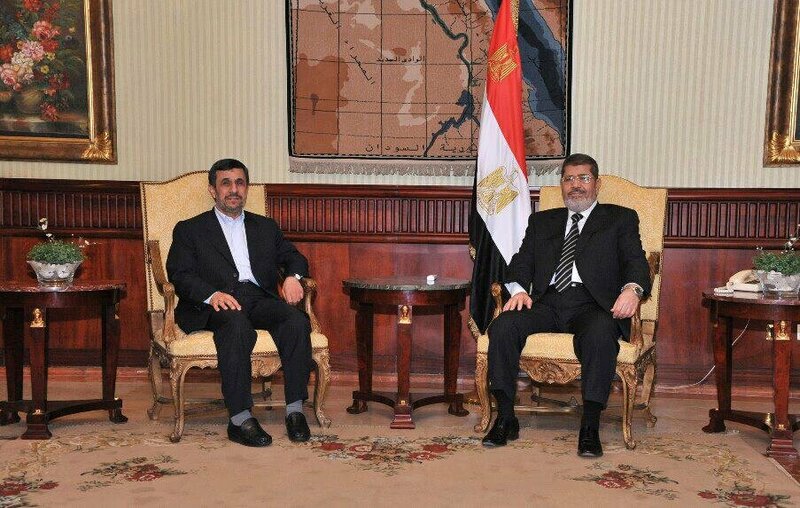 This entry was posted in Egypt, Iran and tagged #Iran, Egypt, Morsi, Muslim Brotherhood. Bookmark the permalink.